The roadside memorial to Sarah Frazer, killed on the Hume Highway. SARAH Frazer stood by her broken down car, sitting atop a tow truck with its flashing orange lights. She and tow truck driver Geoffrey Clarke were on the side of the Hume Motorway, somewhere near Mittagong, in the NSW southern highlands, when a distracted driver ran them both down. 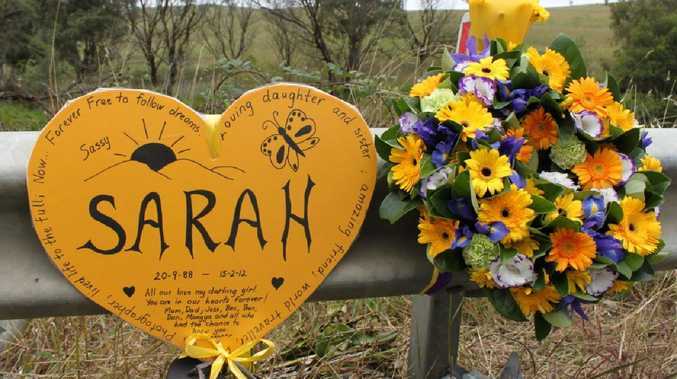 Sarah had been on her way to university, where she was going to study to be a photographer, when she was killed in February, 2012. Geoffrey, a father of four, had rushed out to help the 23-year-old when her car overheated. He too was killed. Kaine Barnett was behind the wheel of a courier truck. A court would hear he must have been distracted for more than 11 seconds to miss the tow truck's flashing lights. Eleven seconds and two devastated families whose lives changed forever. The manner of the distraction was never determined. "She was probably the smartest, kindest person I'd ever met, to be honest," Sarah's father Peter says. "Not to be looking ahead at all times while driving is a terrible indictment. But we know this is common behaviour across all demographics. It's an epidemic, distracted driving." It's this crash that Alex McCredie thinks about as he studies the number of people using mobile phones behind the wheel. Sarah's father is a close friend of McCredie's and they have both spent years campaigning for safer roads. 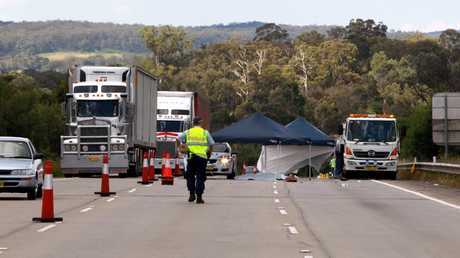 Police at the scene of a double fatality where motorist Sarah Frazer and tow truck driver Geoff Clark were killed when hit by a truck on the Hume Highway near Mittagong in Southern Highlands of NSW. McCredie is the director of a company called One Task, a small startup trying to encourage state governments to use new technology that can monitor exactly how many people are using their phones while driving. A hi-tech camera takes photographs of a driver inside a moving vehicle and a computer program automatically scans the images and selects the ones where a person is holding or using a phone. Those images are then manually checked to verify the mobile phone use. "I find it a real blight on society," McCredie says, "that we see the road toll and think, well, that's just the cost of living in society. McCredie believes his camera could be used not only for enforcement, but also to monitor the success of road safety campaigns. "You can see if people are listening to the message you are putting out," he says. "It should be a no-brainer. "If a government is going to spend millions of dollars on an advertising campaign, it makes sense to get some figures on driver behaviour before and after the campaign. For goodness sake, have a look whether your campaigns are effective." As part of his pitch to state governments, McCredie conducted studies in each capital city using his camera. In Brisbane, the results were horrifying. In just under five hours, 479 people were detected either using their mobile phone or resting it on their lap. It equated to one driver every 33 seconds. 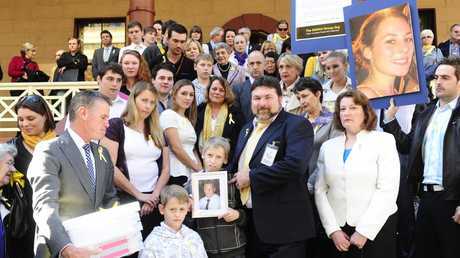 L to R Front row: NSW Deputy Premier Andrew Stoner, Samantha Clark, Aiden Clark, and Bryce Clark -14 who are the family of Geoff Clark, and Peter Frazer, Sarah’s father. Of these, 53 per cent were actively using their phone - holding it to their ear, holding it in their hand or touching it in a cradle. After the death of his daughter, Peter Frazer set up Safer Australian Roads and Highways (SARAH) Group and established National Road Safety Week. They use a yellow ribbon to remind people of the personal impact of road trauma. That impact was highlighted last month when The Courier-Mail and 21 other News Queensland papers ran a "Road to Change" campaign in an effort to stop the carnage. Frazer says McCredie's technology is one way to help with this. It is "absolutely" necessary to change driver behaviour. "This is a serious road safety issue," he tells Insight. 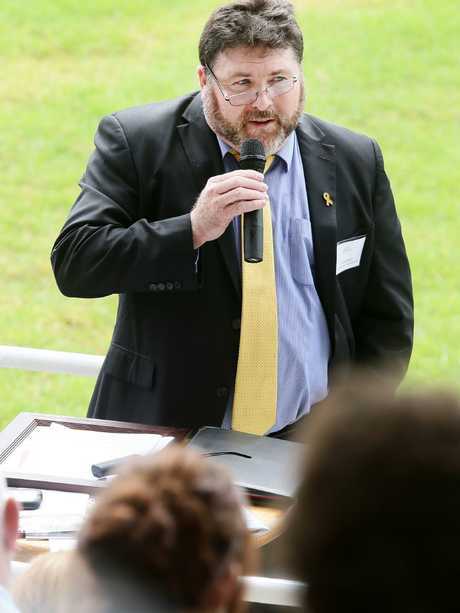 "Using this technology would improve the compliance rates." Queensland government departments are currently monitoring One Task use in other states to see if it would be useful here. But the One Task camera isn't the only resource available to help curb road trauma in Queensland. Cops posing as cleaners, vehicles predicting crashes and electronic signs shaming drivers on their phones are all tactics currently being used in Australia and abroad. Earlier this month Victoria Police went undercover as squeegee guys to catch drivers on their phones. 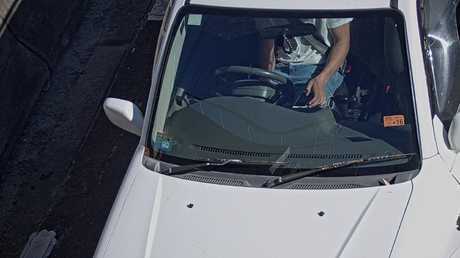 The sting saw covert officers approach cars under the guise of cleaning windscreens, but instead they busted drivers on their phones in Melbourne. The operation reportedly netted more than $18,000 in fines. 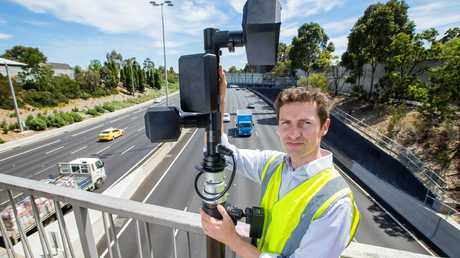 Victoria is also pioneering hi-tech camera devices that scan drivers' eyes for fatigue. The test works by measuring people's pupils and searching for signs of tiredness. A 12-month trial is evaluating how practical it would be and if successful the fatigue test could be rolled out like RBTs and drug tests. Queensland Police Assistant Commissioner Mike Keating says mobile phone use is an enormous problem. 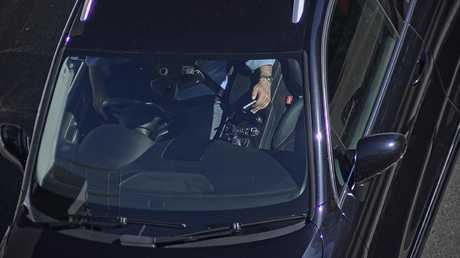 "A large proportion of people actually report that they continue to use their phone (while driving) even though they know it's risky," he says. Keating says police are continually monitoring evolving technology that can be used for road safety and are in the process of rolling out more point-to-point speed camera systems. "We are big on technology," he says. "We have got state-of-the-art technologies in terms of speed camera programs." He says he is aware of interstate trials involving fatigue detection cameras. "That's an area with a lot of innovation," Keating says. "There's a lot of work being done on that in the mining sector and exploration sector. That's where it's actually evolving." In NSW the Centre for Road Safety is trialling technology that can detect crashes "four seconds into the future". The Australian-first Cooperative Intelligent Transport Initiative wirelessly connects vehicles so drivers get messages about potential crash hazards. The trial, the first in the world to focus on heavy vehicles, also communicates with traffic lights and other roadside equipment. Overseas authorities are seeking to shame road users into good behaviour. Using social disapproval as a technique, the UK has introduced electronic signs which detect when a driver is using their phone. The road signs then flash a symbol of a mobile phone with a line through it reminding motorists not to dial and drive. The technology is able to detect whether the driver is using hands-free or not. In Paris where the "zombie" pedestrian phenomenon - walkers distracted by mobile phones - is out of control, authorities crafted a novel response. After 4500 pedestrians were killed or injured in just one year, the Road Safety Authority of Paris rolled out Virtual Crash Billboards. The billboard blares out the screeching sound of car tyres whenever a pedestrian crosses on a red light. A photo of the terrified pedestrian is captured and displayed on the billboard as a reminder not to jaywalk. 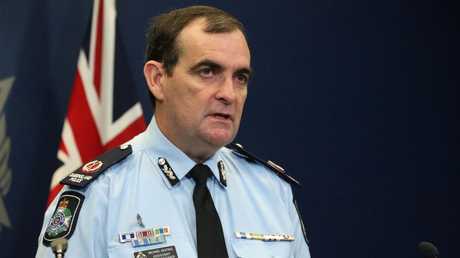 Road Policing Command Assistant Commissioner Mike Keating. A spokesperson from the Department of Main Roads and Transport says they monitor advancements in technology that could help reduce the state's road toll. "We will soon start market engagement to assess a broad range of innovative technological solutions to this growing problem," the spokesperson says. The UK and Norway have also recognised the growing problem of prescription medication and have introduced regulations over their use by drivers. In the UK, laws set thresholds for the amount of prescription drugs a driver can have in their system when they get behind the wheel. But a spokesman for Transport and Main Roads Minister Mark Bailey says the State Government would not be introducing similar laws here. "If a police officer reasonably suspects a person's driving ability has been impaired by any drug, they may require a driver to provide a specimen of blood for analysis," he says. "If sufficient evidence is provided, they will be charged with driving under the influence and be required to appear in court."